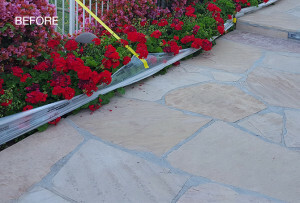 Beyond Stone Solutions’ professional flagstone care and maintenance services include expert interior and exterior cleaning, repairs, sealing and protection, and more. We can resolve any problems associated with your flagstone surfaces, such as moss and mold, efflorescence, pitting and flaking, scratches or other damage. We can also apply color enhancing or topical sealers to achieve the finish you desire. One important thing to note about “flagstone” is that it is not one specific type of stone, but rather the style or pattern of a particular installation. Stones which are most commonly cut into flagstones include slate, bluestone, quartzite, limestone, or sandstone. The flagstones themselves are generally between 3/8” and 1” in thickness and come in cleft and honed finishes. Interior flagstones may also be given a polished finish, but exterior ones typically are not. Flagstones as a whole are quite durable, but some stones are, of course harder than others. A comprehensive knowledge of the compositions and requirements of specific stone types is one of the advantages of having our expert technicians care for your flagstone surfaces. The majority of flagstone installations are outdoors, and as such they are exposed to all kinds of dirt, grime and contaminants, including things like moss and mold growth. With nearly 40 years of experience under our belts, you can rest assured that Beyond Stone Solutions can thoroughly clean and restore your flagstone surfaces to like-new or better condition. If your slate surfaces have become cracked, chipped, scratched, or otherwise damaged, Beyond Stone Solutions can resolve these issues, most often without need of replacement. We can also take care of any grout problems you may have with our deep-cleaning, sealing and repair services. In the wrong hands, your beautiful cleft surfaces can be easily damaged during deep cleaning or restoration. Beyond Stone Solutions has the knowledge of and expertise in the proper equipment, techniques and powders needed to ensure the lasting beauty of your installation. We are always available to answer any questions and to discuss the specific requirements of your unique flagstone surfaces. We recommend sealing all natural stone surfaces to reduce staining and prolonging the look and life of the stone. Having your flagstone sealed and even color-enhanced will make the natural colors of your flagstone emerge more vibrantly. Beyond Stone Solutions not only provides these services, we are also happy to discuss your specific needs and educate you on the best way to care for your flagstone surfaces, whether interior or exterior. We are proud to recommend and supply stone-safe solutions for your regular cleaning and maintenance needs as well. 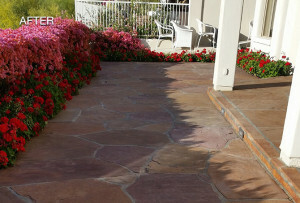 For a free estimate on flagstone cleaning, sealing, restoration and repair, or any other natural stone services throughout the Phoenix, Scottsdale, and Tempe area, use our contact form or call (602) 993-9800 today!